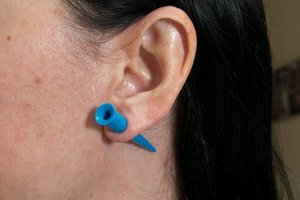 What Causes Gauges to Stink? 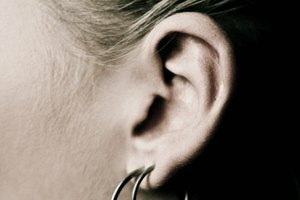 Ear stretching is the gradual stretching of part of the ear with the use of a gauge. As the skin stretches, you will most likely experience an unpleasant odor. Usually the odor is not detectable unless you are close to the ear or smell the actual gauge. Certain conditions may make the odor stronger. Luckily, you can take precautions to keep the odor at a minimum. When your skin stretches from the gauge, it will naturally kill some skin cells during the process. It is very easy to get a build up of dead skin cells around the area, which may cause a foul odor. The larger the gauge you are wearing, the more skin surface that will be affected. Therefore, large gauges may have a stronger smell than smaller gauges. Your gauge may start to smell if dirt, sebum, body oils or lymph collect and build up. The dirt buildup will look like a yellow crust. Lymph is a natural body secretion that is sent to an injury site, such as a gauge site, to help the skin heal. Sebum and body oils are present throughout the body, including the area around the ear. If there is a buildup of any or all of these substances, an odor will most likely follow. Plastic and metal gauges are dense and not as porous as other materials so they don’t allow your skin to breathe. Skin that can’t breathe may start to smell. Silicone and wood are better choices if you want to allow the skin to get fresh air. Avoid gauge odor by washing the area two to three times daily with unscented, antibacterial soap and water. Wash both sides of the ear with clean hands; rinse thoroughly. Periodically remove the gauge to allow it to dry thoroughly and get some air. Avoid touching the gauge during the healing process to keep bacteria from infecting the area. Don't use rubbing alcohol on the site, as this will kill new cells that are trying to grow.